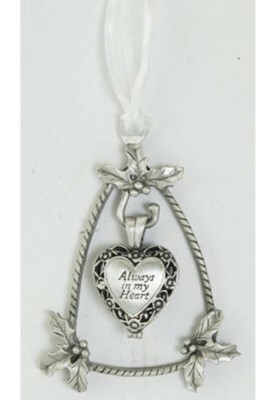 Memorial locket ornament is a beautiful and unique way to remember a loved one. Metal tree shape ornament features holly accents with heart locket center engraved Always in my Heart with filigree design on front and back. Locket contains a solid brass vial to hold ashes. 4" x 2.5" on white gauze ribbon. Gift boxed with message card. I'm the author/artist and I want to review Always in My Heart Memorial Ornament, Holly.